We're often the last to see films that everyone else has already forgotten. It's a bit embarrassing when the film in question is as huge as Iron Man or Avatar. But I think we can be forgiven in the case of My UncleRafael, as it didn't seem to stop at a theater near us. In truth, it was not a national blockbuster, and that's the real shame. 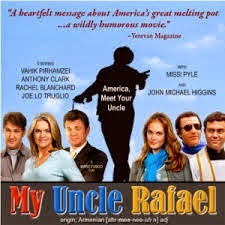 In case you missed it, My Uncle Rafael is a 2012 comedy about a 70-something Armenian who gets cast in a reality TV show. He “adopts” a dysfunctional American family and restores both sanity and humor to their lives by dispensing Old Country-style wisdom and, alternately, slapping the father across the head. The title character narrates the film as he tells his story to fellow students at an English-as-a-second-language class. The first clue that Rafael is a real Armenian comes when he is about to reveal to the class his dying mother's last wish but answers his cell phone instead. 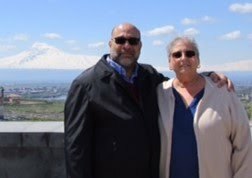 The film is filled with that sort of small detail that struck me as hilarious as well as authentic, as it should be considering the story, as well as the character, are the creation of Vahik Pirhamzei, an Armenian actor and comedian from Iran. Some of the characters may be caricatures but it's all in fun and Uncle Rafael's advice is actually quite solid. It's also worth noting that the film is extremely professional: You'll recognize many of the actors, and the production values are excellent. We found the movie by chance while searching through Amazon's streaming video collection. 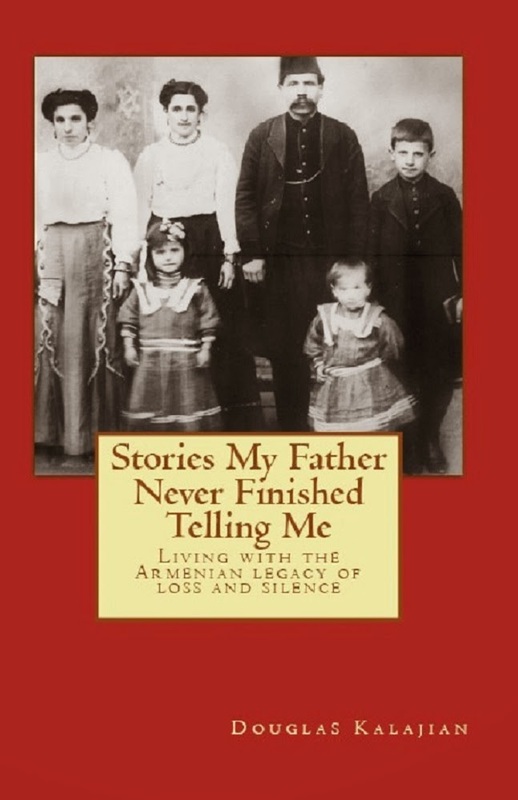 If you're Armenian, it's well worth seeking out. If you're not, I'd still be curious to know what you think. The mainstream reviews were not glowing, but for my money Vahik is at least as funny as Tyler Perry. Perhaps odars (non Armenians) just didn't get the jokes? One of the running gags is about nazook, a flaky Armenian pastry resembling rugelach, which is served to everyone on every occasion whether they need cheering up or just filling up. The constant reference to nazook in the movie got us thinking ... this was one recipe we hadn’t posted on The Armenian Kitchen. Nazook is irresistible – especially when served with coffee, tea, or even a cup of hot chocolate. Be warned: once you start eating nazook, it's hard to stop! If you happen to have any left, you’ll be happy to know that nazook freezes well. Nazook - ready to serve! Without further ado, here is our version of scrumptious, slightly sweet, buttery, flaky NAZOOK! 1. Add yeast to the yogurt and mix together. Allow this to rest for 10 minutes. 2. In a large bowl, combine flour, salt and softened butter; mix with a pastry blender, fork or your hands until mixture is crumbly. 3. To the flour mixture, add egg, vegetable oil, lemon juice and yeast-yogurt mixture, mixing well. Dough might be a bit sticky. If so, add a little more flour, but do not dry out the dough. 5. Wrap dough with plastic wrap. Refrigerate at least 4 hours, or overnight. Step #4 for dough prep. Mix the 1 cup of melted butter and flour until combined. Add sugar, chopped nuts (if using), apricots, raisins or currants (if using), vanilla, cardamom, and cinnamon. Stir until the mixture is smooth. 2. Melt 3 tablespoons of butter and set aside. 3. 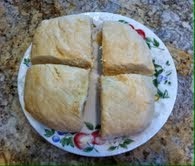 Remove dough from refrigerator; divide into 4 equal portions. 4. Roll each dough ball into a rectangle. Brush with melted butter. 5. Spread 1/4 of the filling over each rectangle, leaving 1/2” border. Gently press the filling into the dough with your hands so that the filling sticks to the dough. 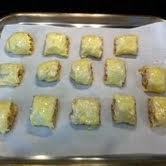 Fold the edges in 1/2” over the filling. 6. 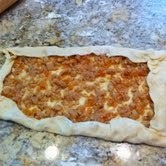 Starting with the long side of the dough, slowly roll it into a long log shape, making sure the filling stays in place. Gently flatten with the log the palms of your hands. 7. With the seam-side of the log facing down, cut each log into 2” pieces using a serrated knife or a crinkle cutting tool. 8. Arrange each piece, seam-side down, on lightly greased – or – parchment-lined baking sheets, spacing the nazook at least 1 ½ inch apart from each other to allow for even baking. 9. Brush tops generously with the egg-yogurt glaze. Bake for 25-30 minutes, or until golden brown. Place each nazook piece on a wire rack to cool completely. I got to taste them! Wow! Delicious. Sweet, flaky, but substantial. Loved 'em. Glad you liked the nazook, Dave. It's definitely a no nonsense dessert! I am Iranian-Armenian and the true nazook does NOT have raisins, apricots, etc. That doesn't say I won't use your recipes. Thank you will try this weekend. Thanks for your comment, Anon. I realize I took a few liberties by adding the dried apricots and nuts in my version of nazook, but of those who ate it, no one seemed to mind. Good luck trying it this weekend!